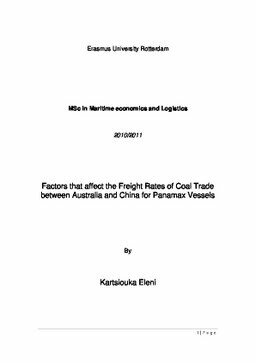 The aim of this thesis is to name, explain and analyze the factors that affect the freight rates of coal trade between Australia, the biggest supplier of coal globally and North China, one of the largest importers of coal in Asia and in the world. The thesis has been divided into various chapters which aim at analyzing these factors through literature review and then focusing into the most important ones quantitatively. A review of the different factors which affect charter rates has been done and the most important ones such as commodity demand and industrial activity have been used in order to build an analysis for the demand for coal in China as a result of growing industrial activity. The required data related to the relevant charter rates and variables related to the industrial activity such as power consumption and steel production have been described. A qualitative analysis of the terminal facilities in the origin as well as the destination country has been done. In the methodology chapter the factors described above have been applied under correlation methodology to find the results.